What are the Different Types of Online High School Courses? 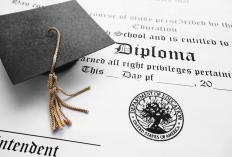 People may enroll in online high school courses to earn a diploma rather than earning it through a traditional program. There are various types of online high school courses in which a person may enroll. For example, a high-school-aged student may take online high school courses as part of a homeschool or cyber-schooling program. Sometimes a high school student who attends a traditional high school may also enroll in online courses for advanced placement. An adult high school dropout may even enroll in online high school courses to earn a diploma rather than earning it through a traditional program. One type of online high school course is used for a student who is enrolled in a public or private high school but is allowed to learn via the Internet. In many cases, this sort of situation is referred to as cyber schooling. Typically, a person who enrolls in this type of program has teachers who assign and check his work, monitor his performance, provide feedback, and assign grades. Often, these teachers track attendance as well. The student is usually subject to the same performance and attendance rules as students who attend brick-and-mortar schools. A person may also take online high school courses as part of a homeschool program. For example, a homeschooled student may take an online course that provides credit for his home education program. In most cases, the homeschooled student is under the supervision of a parent while taking online high school courses. These courses may be used to teach advanced topics, allow the student to further explore his interests beyond his normal studies, or to obtain feedback from a teacher outside of his normal homeschool program. An individual may also take online high school courses for advanced placement. In some cases, online advanced placement courses give a high school student the opportunity to take classes that provide him with college credit. In others, these courses challenge a student with work that is more advanced than typical high school courses. In some cases, taking advanced placement courses online helps to prepare a student for college-level work and may encourage college admissions officers to consider his high school transcript more favorably. Sometimes online high school courses are intended for adults rather than students who are high school aged. For example, an adult who dropped out of high school may eventually take online classes to earn a high school diploma. These classes may prove particularly convenient if the adult works during the day and can only pursue his education at night. How Do I Choose the Best Part-Time Diploma Courses? How Do I Choose the Best Job Placement Courses? How Do I Choose the Best Night School Courses? What Are the Different Types of Part-Time Jobs for High School Students? What Are the Different Types of Online Teaching Opportunities? What are the Pros and Cons of Homeschool for High School?